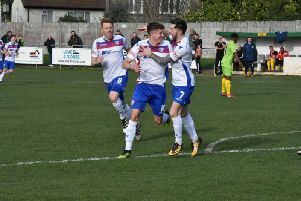 Andy Peaks hailed his “absolutely fantastic” AFC Rushden & Diamonds players after they secured the club’s third promotion in six years at Hayden Road last night (Tuesday). Needing a win to wrap up elevation to Step Three, Diamonds produced an excellent display as they thrashed Aylesbury FC 7-1 and the promotion from the Evo-Stik South League East was confirmed as third-placed Hartley Wintney suffered a 1-0 defeat at Kempston Rovers. Beaconsfield Town were also promoted and now, either them or Diamonds will be crowned champions on the final day of the season at the weekend. But boss Peaks’ main aim all season was to ensure his team claimed one of the automatic promotion slots, having missed out in the play-offs in the last two seasons. And he was understandably delighted to see it unfold in the club’s first season at Hayden Road. “We have finally got to where we have been trying to get to,” the Diamonds manager said. “It has been a tough three years but we have achieved what we wanted and we did it in some style as well. “We dominated the game for long periods and we were clinical, which is not something we have always been. “I can’t fault the boys. They thoroughly deserve to be promoted and I am really pleased for them. “They have been fantastic across the season, there haven’t really been any bad spells. They have been absolutely fantastic. “Us and Beaconsfield are the ones who have been up there for most of the season. There were wonderful scenes of celebration as the final whistle blew at Hayden Road and Peaks knows how much this season will mean to the volunteers and fans behind the scenes. “I think it means everything to a lot of people here,” he added. “These people give up a lot of their time and they give us the best of the best.